We definitely felt rushed. It simply wasn’t possible for us to adequately cover the entire 356,000-square foot Denver Art Museum in the scant two hours allowed by our parking meter. In the time we had, we did manage to cover enough ground to appreciate DAM’s high quality collection and fabulously arranged display areas. Tiny grains of colorful sand are carefully arranged in elaborate patterns to form sand mandalas. The extremely delicate work is used in Hinduism and Buddhism to support meditation. 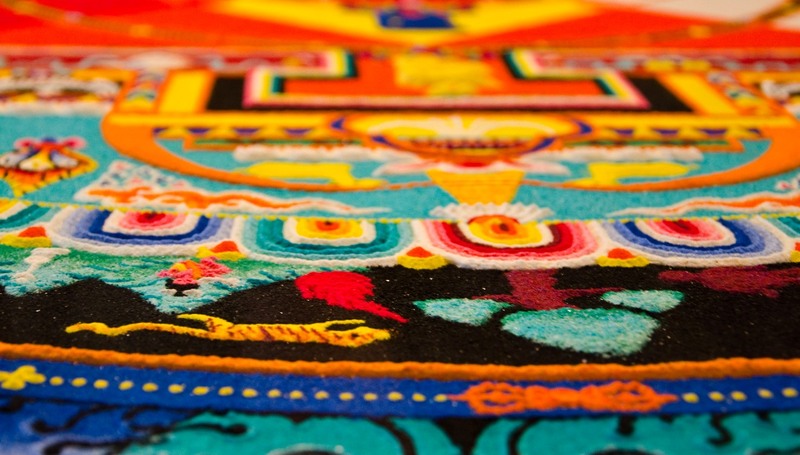 This particular Hayagriva Sand Mandala was created by Tibetan monks. 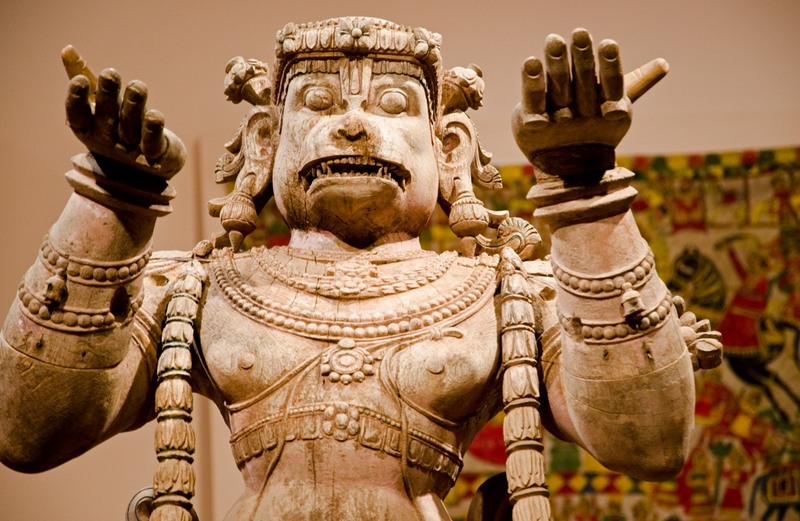 A wooden processional figure of Hanuman; a Hindu monkey general and deity. How cool is that: Monkey General? 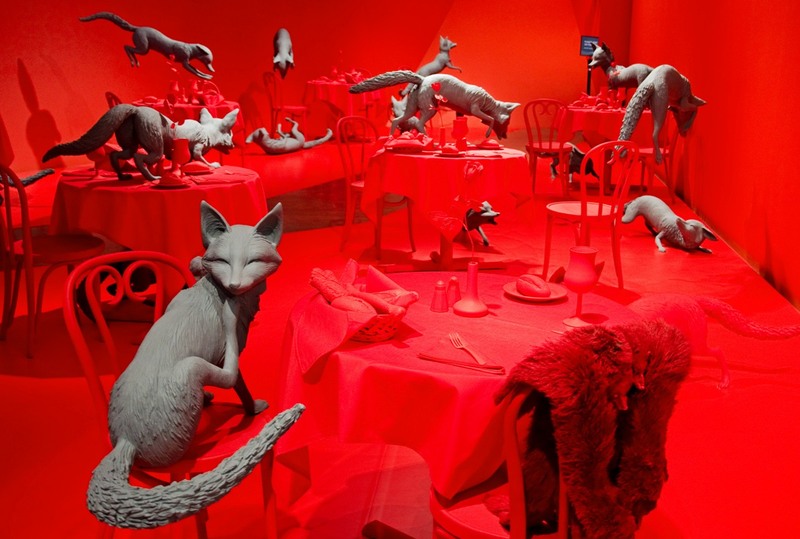 I can’t claim to have much insight into Sandy Skoglund’s Fox Games; but they’re foxes, playing games in a red restaurant. What’s to understand? The Denver Post described it as “a nonstop, eye-popping knockout.” I agree. There is something really, really interesting about the display. It’s almost as cool as monkey generals – almost. It’s pretty crazy to see. Even up close it’s hard to tell it’s made completely from colored sand. They had a photograph showing the monks assembling it with tweezers and wearing masks so that their breathing didn’t disturb the sand grains. Love the fox games. What’s with the skulls piece? Thanks for sharing. 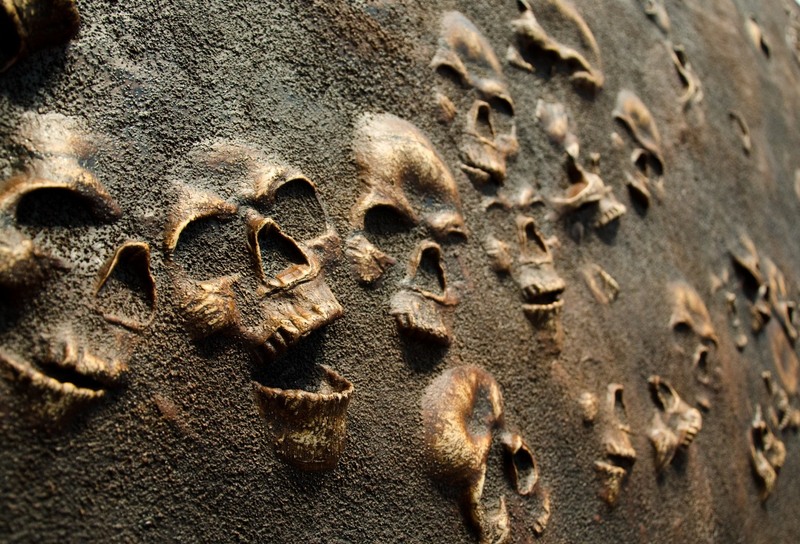 I honestly missed the tag describing the skull fresco, so I don’t know anything about it. I just think it looks cool. I too like the skull picture. It reminds me of the ancients looking forward to us, as we look back at them. From where we came to where we will go. Nice interpretation. I like it.